Certain SD Cards Clear Buffer Faster? Will a different focusing screen help? Another newer Windows 7 "Warning" - Will officially become unsupported January 2020. On Friday, our journalist was invited to the Pentax HQ in Tokyo to get a hands-on look at the new Pentax K-50, K-500, and Q7 (more information about these products can be found here). In addition, Pentax USA has sent us a production copy of both the K-50 and the Q7 cameras, so we expect to be able to bring you some full-size sample photos on Tuesday or Wednesday. In-depth reviews will of course follow. 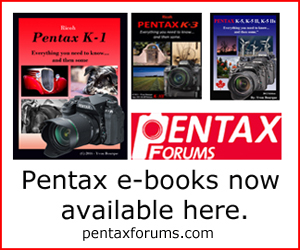 Until then, we have prepared preview videos of both new Pentax DSLRs. The Pentax K-50 is the new weather-sealed / upper entry-level offering from Pentax. It will compete with the Canon T4i/T5i and Nikon D5100/D5200 DSLRs. The K-50 and the K-30 share the same specifications except that the K-50 has gotten its ISO limit boosted to a maximum of 51,200. In addition, the K-50 ships with weather-sealed kit lenses and has an updated design. Its button layout remains the same, however. The K-50 can now be pre-ordered for $699. The Pentax K-500 represents Pentax's return to the entry-level market. Owners of this new camera will basically get to enjoy the same image quality and features that the K-50 has to offer. The $180 price difference is justified by the fact that the K-500 lacks weather sealing, an electronic level, and AF point display in the viewfinder. In the US, the K-500 will ship with a AA battery holder rather than a D-LI109 battery, though it is compatible with both. Canon's Rebel SL1 and Nikon's D3200 are comparable to the K-500. The K-500 will not be available as a body only; the 18-55mm kit can be pre-ordered for $599. One key selling point of both the K-500 and K-50 cameras is that they feature pentaprism viewfinders with 100% coverage. At 0.92x magnification, they are also slightly larger than what the competition has to offer. Check out or K-30 vs T4i vs D5100 comparative review to learn more about the pros and cons of Pentax, Nikon, and Canon entry-level DSLRs.